Post World War II marked the end of colonialism and the commencement of US led globalization. The economic and political transition ushered a period of brutal dictators, military rule, and US funded leaders throughout Southeast Asia. Proxy wars raged as the US and USSR sought to establish their economic “brand” internationally through forced nation building. For all the efforts world powers placed in exporting their brand, it was an obscure, non-US or USSR influenced city state that emerged as the defining country model. A country of less than five million, in a space half the size of Los Angeles, developed a “brand” that citizens from Indonesia to the Middle East implored their leaders to emulate. The “Singapore Model” successfully merged traditional Confucian thought with Western rule of law and generated the greatest economic and livelihood success story of the 20th century. The pragmatic and rational approach of its architect, Lee Kuan Yew, even influenced Deng Xiaoping, who after visiting Singapore in 1978, started to loosen China’s state run enterprise and emulate Lee's economic vision. Singapore’s rise is attributable to many factors although at the country’s inception in 1965, no one beyond Lee Kuan Yew could have predicted the final outcome. Lee’s initial goal was to protect the country and ensure his vision could be executed. His first step as prime minister was creating a strong military to protect the small country from potentially aggressive neighbors. Currently, the country’s defense spending by GDP is third after the US and Israel showing the continued emphasis and commitment to protect a nation and its ideals. Compulsory service of males, upon reaching the age of 18, provides a continuous supply of new recruits. Lee then set course on creating a country and society that its citizens would be willing to die for to protect. Lee embraced multinational corporations. Most Asian countries were disgusted with their former colonial administrators and had no desire to engage in economic relations. A few went to the opposite extreme of colonialism and converted their economies to state run communism. Lee’s alternative and pragmatic approach, knowing that Singapore would need Western investment and innovation, helped raise GDP from $974M USD in 1965 to $298B USD in 2013. By comparison, the Philippines, a former US colony with a continued US influence saw their GDP raise from $5.8B USD in 1965 to $272B USD in 2013 - the Philippines has twenty times the population. To attain these results Lee Kuan Yew adhered to the tenants of a free market economy - there’s no minimum wage and only seven mandatory vacation days. Singapore’s a free port and tariff free economy, except for beer, wine and alcohol, and tobacco products. It’s a beacon of free market management until you become aware of Temasek Holdings, a government owned and operated investment fund that outright owns Singapore Airlines, the national air carrier, and effectively controls Singtel, the national telecommunications company, and MediaCorp, the primary news and entertainment provider. It’s not a shock then that Reporters Without Borders ranks Singapore at 153, behind Russia, in their Freedom of the Press Rankings (US 49th). The Singapore Model is not limited to business and economic success. The country is a healthcare leader. In 1965 life expectancy was 67. In 2012 81. (US - 70 and 79, respectively.) This age increase, as well as improvements in under five mortality rate (3 per 1,000 vs. 8 in the US) and adult mortality rate (60 per 1,000 vs. 100 in the US) is attributable to Singapore having the sixth best healthcare system in the world (US ranks 37th). Singapore attained these results spending only 4.7% of GDP on healthcare (US 17.9%). Lee’s thoughts on entitlement, specifically healthcare, were heavily influenced by his experience as an exchange student in England. Initially impressed with the UK’s system - eyeglasses, dental and medical exams were all free - he later changed his mind observing that a state’s cradle to grave system diminished citizen's “desire to achieve and succeed”. When creating a healthcare system for Singapore he intentionally set out to avoid an entitlement state. Singaporeans would be personally responsible - a hallmark of conservative rhetoric...until the details are outlined - then becomes clear that while Singapore preaches personal responsibility, the government effectively forces adherence. Singaporeans pay for healthcare services from mandated income savings allocated to Medisave, a national health savings plan, which can be used to purchase insurance and saved for future medical expenses. The underlying theoretical concept being that people are more critical on costs and services if they pay out of pocket directly upfront instead of an insurance company picking up the bulk of the cost a month later. The upfront payments also help to lower demand, which lowers costs. On the supply side, government oversight reaches a new level involvement, higher than even the most socialist European countries. Singapore, the most free-market economy in the world, recognized that principles of the free market conflicted directly with providing affordable, nationwide healthcare - that purchasing new, expensive, and unnecessary equipment to attract patients only raises costs; that seeing multiple doctors only raises costs. With over 80% of its citizens receiving healthcare services at public facilities controlling costs is a major initiative. Singapore does have private facilities, however, with so many citizens relying on public care, these private facilities must compete more closely on cost - for example, a coronary artery bypass surgery that would cost $55,000 in the US, only costs $13,000 at a private Singapore hospital. To control costs the government requires transparency and the posting of hospital bills online. When the market fails to keep costs down, the government directly intervenes - hospitals have five classes of wards, offering five levels of services...the government fixes the percentage breakdown of these wards. Government approval is needed for public hospitals to purchase new equipment. The government also regulates the number of local medical students and the entrance of doctors holding foreign degrees thus controlling the volume of physicians able to practice in the country. These efforts may seem extreme, however, as noted above Singapore has one of the worlds best healthcare systems at a fraction of the cost as others. The country’s long term view and planning means its also more likely to handle the costs of chronic diseases such as diabetes...from both a prevention and treatment standpoint. The government generates awareness of diseases and will even control fruit and vegetable prices at supermarkets to facilitate better shopping decisions. Carrots, lettuce, and fruit are noticeable cheaper than Hong Kong, while beer and alcohol are much more expensive. Given carte blanche Lee Kuan Yew created a city that feels like a suburban paradise, which is an impressive feat considering Singapore’s the third population densest country in the world after Monaco and Macau. For comparison, visit Hong Kong, the fourth most densest “country” in the world, and ride the metro during rush hour - train cars are noticeably more crowded. You’ll experience that density is as much a qualitative statistic as a quantitative. It’s not all the same type of people packed together. Three major ethnic groups - Malays, Tamils (Southern Indians), and Chinese - live in relative harmony. The government recognizes official holidays of four major religious groups - Buddhist, Hindu, Muslim, and Christianity (Good Friday is an Official Holiday in Singapore, not in the US). It’s not the “melting pot” society of the early 1900s America but there’s significantly less conflict among these groups living in such tight quarters in Singapore than there is on the larger, global scene. Creating a government based upon rule of law and strict penalties helps to ensure that these groups receive equal treatment and feel protected. Connecting Singapore is one of the cheapest public transportation systems in the world. The system conveniently (and quietly) transports residents and guests from one end of the island to the other in less than an hour. The low cost is partially possible because the government charges a $10,000 USD per year license fee for car ownership. Metro rides showcase that park landscapes are as much of the scenery as modern skyscrapers and apartment buildings. Stations are near apartment buildings created through Singapore’s Housing and Development Board. 80% of the population lives in government housing. Housing estates operate as local townships offering schooling, shopping, and recreational activities. When deciding where to purchase a home (95% of those in public housing own their unit) there’s no “bad” neighborhoods. Singapore’s one of the safest countries in the world and has the third lowest homicide rate (US, 108th). There were eleven murders in 2012. The Philadelphia metropolitan area, roughly the same population, passes the eleven murder mark every two weeks. And yes, you may own a gun in Singapore, albeit via a lengthy registration process. Guns, but no gum. Singapore even won an award for having the best airport in the world...for the fourth time in the fourteen year history of the award - all part of a strategy to bring business, tourist, and investment to the country. 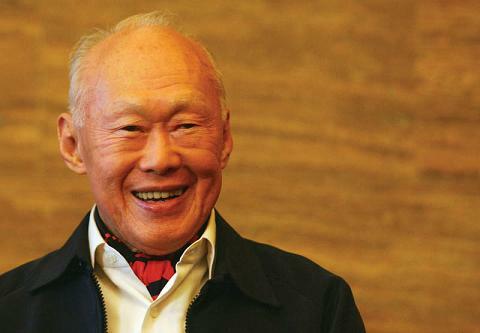 Lee Kuan Yew was certainly the right man, in the right situation, at the right time. Anticipating the economic boom of globalization he created a rule of law society and the best location for US and European corporations looking to establish Asian headquarters. Lee was first out of the gate, the first to welcome Western investment. Of the US Fortune 500, approximately 300 have global operations significant enough to justify an Asian headquarters - of those 300, 40% select Singapore. Their arrival brought high level, skill positions, not low level, repetitive task type work. Singaporeans rank second in the OECD PISA Education Rankings (US 36th) offering companies access to a well educated and easily trained workforce. These are jobs that surrounding countries can’t simply recruit by offering lower wages, lower taxes, or a better operating environment. The Singapore Model extends beyond serendipity and contextual good luck. Lee still had to execute his plan and most point to the authoritative approach with how this plan was executed as contributing to Singapore’s success. He served thirty-one years as the prime minister and was re-elected multiple times for five year terms. During that time he limited freedom of the press, sued political opponents for libel, and had others jailed without a trial. After leaving office in 1990 he served as a Senior Minister and received a Minister Mentor title in 2004 when his son became Prime Minister. His People’s Action Party has retained political power since the country’s inception, always winning at least 60% of the vote. Critics state that this long period of rule, with little opposition, gave Lee the runway to implement his policies free from intervention. This may be the case, however, his policies reflected acting on the best behalf of his constituents. Questions raised about following a single party, continually electing the same officials, and whether that truly constitutes democracy could just as easily be asked in the US. Philadelphia has been a Democrat led city longer than Singapore has been a People’s Action Party led country. US Senators and Congressmen have served longer than Lee Kuan Yew. Dismissing Singapore’s success because of the authoritative approach and limits on personal freedom demonstrates a limited understanding of the Asian culture, a narrower view of freedom, and unawareness of one’s own country policies - the US, UK, and other Western powers have a horrible historical record in Asia. The authoritative approach is worth consider in the context of whether Singapore’s results can be duplicated elsewhere and the ultimate “do the ends justify the means” analysis. Do high ranking economic, healthcare, education, and living condition results justify an authoritative approach? Singapore's strict authority blurs the concept of freedom. What is freedom? The right to protest? The right to own a gun? The right to free speech? The right for anyone, to safely walk any street, at any time? The right to a clean and orderly living environment? Who receives a fairer application of rule of law - African Americans in the US or Indians in Singapore? Singapore may not answer all of these questions although the country serves as a distinct data point for anyone arguing an absolute definition of freedom and democracy. The Singapore Model transcends time, place, and approach because the underlying themes are universal. The Model is based upon Pragmatism, Corroboration, Transparency, and Endurance. Lee’s views and decisions were pragmatic. He put aside political, ethnic, and religious differences to create a society based upon integrity, meritocracy, and diversity. Actions were based upon what's best for the group and the country, not the individual. Actions were based upon facts and scientific analysis. Lee supported the legalization of abortions because poor people have more children; these children would then be a drain on the country’s future resources. That’s a harsh analysis with no consideration of “rights”...yet statistics validate the viewpoint. Once children were born Lee’s policies provided equal access to education regardless of a parent’s wealth and provided a path for future upward mobility. Singapore's healthcare success shows how well the country's administrators corroborate across ministry lines. Improving healthcare and lowering costs is not limited to doctor and hospital visits. It’s ensuring citizens exercise, they drive carefully along well maintained roads, they eat healthy and have access to cheap and high quality food. They live in a clean and safe environment. This requires dialogue, compromise, and action across multiple government departments. Singapore advocates transparency and policies are conducted in the open. An anti-corruption board has the independence and support to pursue and root out inappropriate activity. Singapore policies acknowledge "hard truths" and fundamental, constant concepts. Plans should be made to last and consider future trends rather than simply adjust to the current political climate. These themes transcend conservatism, liberalism, and government style. They transcend population size and geographical footprint. They transcend person and place. They transcend business development and economic wealth. The main directive of a political official or statesmen is to act in the best interest of the country, recognizing the inter-connectivity of all aspects, in an open environment and free from corruption, with an enduring vision. That’s not the Singapore model. That’s the original US Model.